All of our year groups complete medium and long term planning following discussion with the children in each class who influence and often choose key elements of what they intend to learn across the year. Examples of planning for each year group can be viewed below. Good planning is the key to making children’s learning effective, exciting, varied and progressive. Effective planning builds on and extends what children already know and can do. Long term planning includes an overview of the topics to be covered (although these are flexible and will be changed in line with children’s interests) including cultural and seasonal influences. Play and development opportunities are created for the indoor and outdoor play spaces as part of the long term planning. Medium term planning includes a grid of what will be covered across the seven areas of learning across a half term period. This includes planned trips and outings as well as celebrations and important events. Short term planning takes the form of weekly planning sheets where every child has individualised opportunities based upon previous observations, assessments and learning. Please contact us if you have any questions about our curriculum or want to find out more. 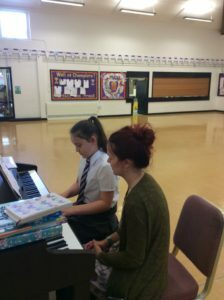 Pupils are offered the opportunity to take up tuition, with group or individual lessons, on a range of instruments. These lessons take place during the school day or after school. Please contact the school office to learn which instruments are available and the cost of lessons. Advice on hiring or purchasing an instrument can also be arranged through Music Partnership North. Further information about this is available on our website at http://music.northumberland.gov.uk.